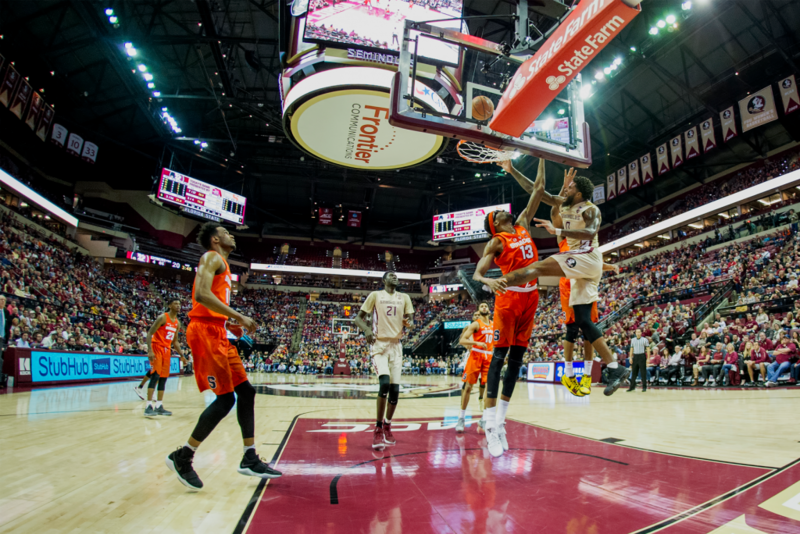 TALLAHASSEE, FLA. – The Syracuse men’s basketball team fell in double-overtime to No. 23 Florida State, 101-90 in a high-scoring ACC showdown. The Orange suffer their fourth consecutive loss of the season. They fall to 12-6 overall, but more importantly, drop to 1-4 in conference play. On the other hand, the Seminoles (13-4, 2-3 ACC) get back to their winning ways after falling short to Louisville 73-69 on Wednesday night, which snapped their 28-game home win streak. With great effort, comes positive outcomes. When I asked the 42-year veteran coach, “what positives can you take out of this game moving forward.” Boeheim refused to answer. His focus seemed to solely be on what happened against Florida State. From the start, it was a sloppy first half for both teams. Turnovers and missed shots was the story in the first 20-minutes inside the David L. Tucker Civic Center. Syracuse looked out of sync. Nothing on the floor was going their way. The game plan looked to be repeated mistakes from their past losses an it dug the Orange into a 10-point halftime hole. Tyus Battle led the second half Syracuse surge. He dropped 32-points. The 6’6 guard was 4-5 from downtown, he led all scorers in the game with 37-points. Battle’s biggest shot came in the final moments of regulation as he hit the game-tying three-point shot with six seconds left. “I thought we fought as well as you can, and made a steal late to give us a chance and then Tyus made the three to tie it,” Boeheim said. Clutch shot to say the least. It looked like the Orange had finally figured things out when they extended their overtime lead to 78-74. The Seminoles wouldn’t go down without a fight though. They kept up with the Orange throughout the first overtime, but it would be Trent Forrest’s two-point floater that tied the game up at 82 with less than 30 seconds to play. That would seal the deal for the first overtime. The second overtime was all Florida State. The Seminoles out scored the Orange 19-8 in the final period of play. “That was a great effort, a tremendous effort, they really played good defense, they pressured us the whole game.” Boeheim said. The Seminoles used their height to their advantage, slamming two big dunks to pad their lead sending home over 10,000 FSU fans home victorious.